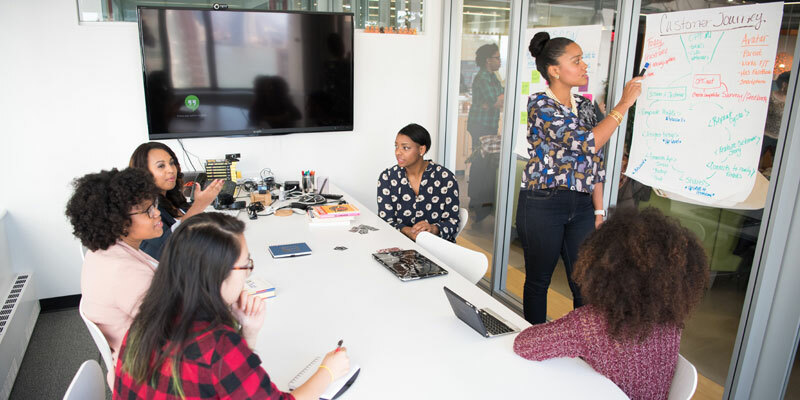 Two main barriers arise when there are 15 people or more present in a brainstorming session when attempting to discuss multiple ideas or problems in the same time. Most brainstorming tools and methods focus on a small group of people discussing one single problem, focus the thinking process for all attendees in one particular direction. What if the number of people involved increased and the ideas become more complex? 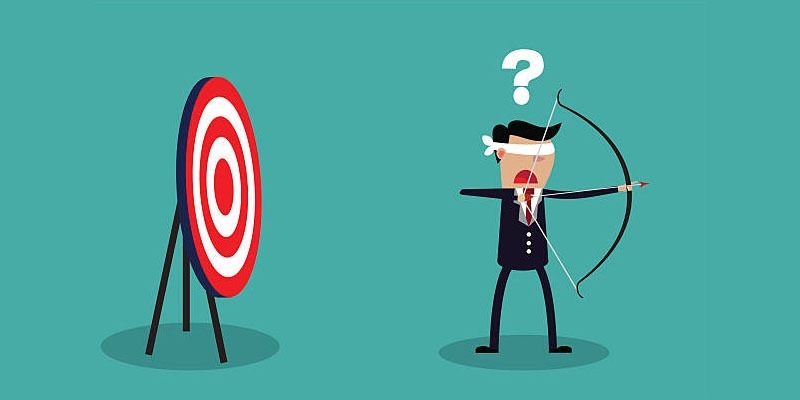 This challenges the meeting facilitator and usually leads to failed creative thinking sessions as well as a loss of time and effort. 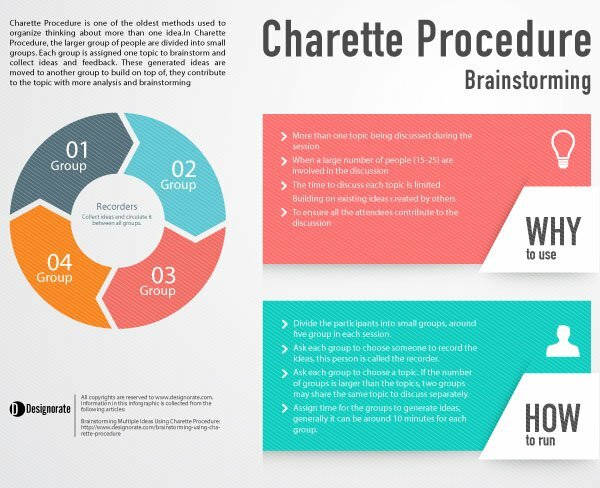 Charette Procedure is one of the oldest methods used to organize thinking about more than one idea within a large group of people. It was first used in the early 1800s by architecture students who utilized carts to move from one place to another to get fast approval of their work, In Charette Procedure, the larger group of people are divided into small groups of approximately five people, with the number dependent on the number of ideas discussed. Each group is assigned one topic to brainstorm and collect ideas and feedback. These generated ideas are moved to another group to build on top of, they contribute to the topic with more analysis and brainstorming. The topic keeps moving until it is discussed by each of the groups and the final ideas are collected, analyzed, organized, and prioritized to reach final solutions for the discussed topic. If there are a number of topics to discuss, then topic notes can be circulated simultaneously among the groups. Note: This article is part of our Design Thinking free course. Check this course now. When to Use the Charette Procedure? Divide the participants into small groups, around five group in each session. Ask each group to choose someone to record the ideas and document them, this person is called the recorder. Ask each group to choose a topic. If the number of groups is larger than the topics, two groups may share the same topic to discuss separately. Assign time for the groups to generate ideas, generally it can be around 10 minutes for each group. Each group discusses the assigned topic and the recorder collects the ideas to document it through notes. The leader for all the groups may warn the attendees about the time to make sure they are focused and remain active in discussing all the ideas within the 10 minutes limit. The recorder takes the ideas from the first group and moves to the second group to facilitate discussion of the ideas created by the initial group. The recorder collects and document the new ideas that may be generated based on this second round. The recorder repeats the process with the third group. All groups are asked to review and discuss each the ideas related to all topics. At the end round of the discussion, each group is asked to prioritize the ideas based the most important and significant ideas in each topic. Each recorder collects all the ideas, and summarizes them based on each topic. This step merges the efforts of all the groups and helps to compare the collected ideas for a more complete understanding of the topics. The entire group meets and discusses the results related to each topic. At this stage, they review the priorities of each decision. The resulting decisions may be implemented in the form of an Action Plan for the next stages of the project. 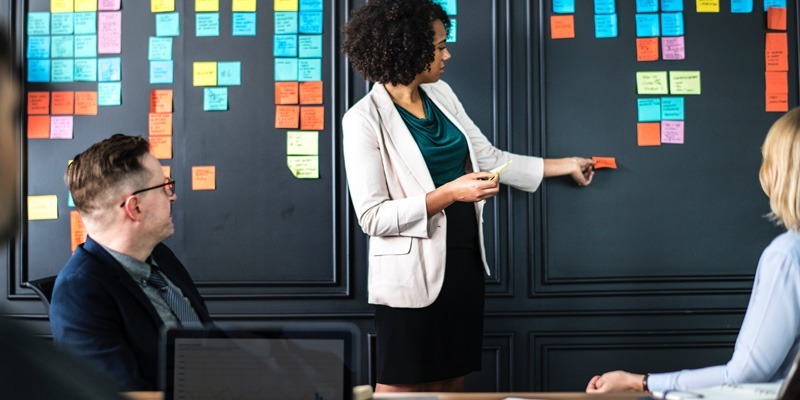 The Charette Procedure can provide a solution for many reported problems that brainstorming sessions face, including issues related to a large number of session attendees and discussing multiple topics in the same timeframe. The above steps organize the meeting to overcome barriers and ensure everyone is active in the conversation. Charette Procedure also guarantees that all topics are being discussed equally and with the same level of interest. Charette Procedure can be easily adapted to work alongside other brainstorming sessions. For example, groups can use a brainstorming session like mind mapping or a problem-solving session, such as the TRIZ method or the 8D Process, during the group discussions to reach more innovative ideas and solutions.